Doesn’t matter how much points you or rebounds you get if you can’t play. Just ask Grant Hill, Tracy McGrady or Yao Ming. Possessing a Greek god-like body with muscles on top of muscles, Karl Malone played all 82 games in 11 of his 19 seasons with the Jazz. 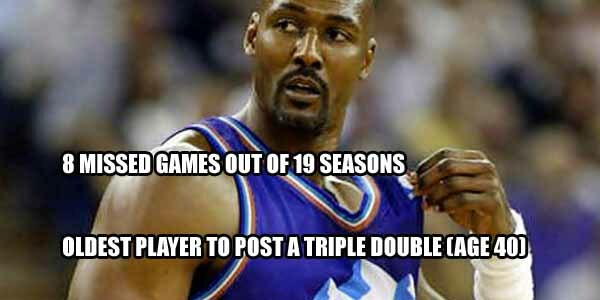 He only missed 8 games during his time in Utah and three off those were due to suspension. He missed 39 games during his final season with the Lakers, but he was not only one of the few players to play at 40 years old, but also the oldest player to record a triple double.